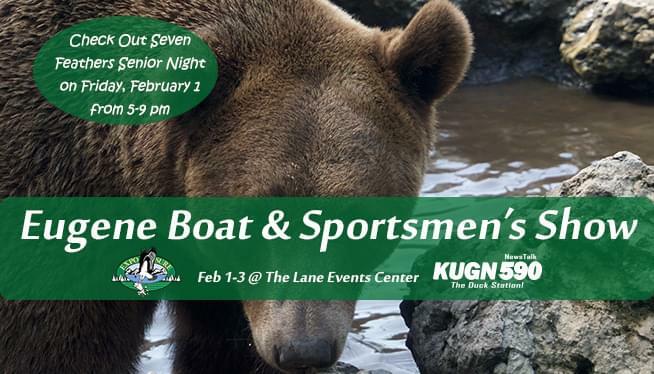 It’s time once again for the Eugene Boat & Sportsmen’s Show, sponsored by KEZI 9 News. This year’s show is going to be jam-packed with 100s of exhibits, displays and attractions representing the breadth of the outdoor recreation industry: boating, camping, fishing, hunting, RVing, ATVing, cycling, kayaking, paddling, hiking, biking, climbing, travel agents, tour guides, guns, cabin life, wildlife art, taxidermy, outdoor clothing and gear, advocacy groups and governmental agencies, seminars and fun for the whole family! And make sure you go on Friday for the Seven Feathers Casino Free Senior Night! That’s right! From 5-9 pm on on Friday, people 65 and up get into the show for FREE, courtesy of Seven Feathers Casino Resort, The Register-Guard and your pals at KUGN. you don’t have any excuse not to check out this year’s amazing expo.